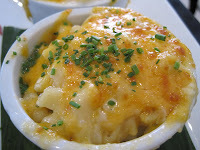 I got to cross another 'must-try' restaurant off my list today with my friend Sara (check out her review here). She'd been to Cafeteria before, but I hadn't (even though Jenezuela lived around the corner for years!) 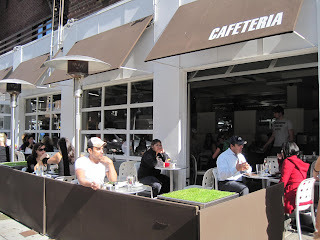 For some reason, Jenezuela & I stuck to 8th and 9th Aves when eating in her hood, and rarely made it to 7th. We started off with our drinks: Sara opted for the Peach Palmer (an Arnold Palmer, aka equal parts iced tea and lemonade, with peach purée added). Hers came in a Mason jar. 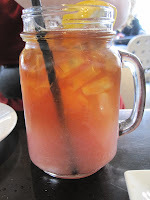 I ordered the mint-lime iced tea. It was almost puckeringly-limetastic. Very tart, with just enough sweetness for your face not to collapse on itself with all that lime. 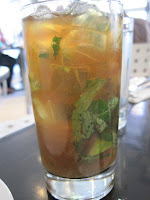 It was like an iced tea mojito (sans alcohol!). Sara is also a food blogger, so we laughed when we both whipped out our cameras. I also love that we have similar tastes. 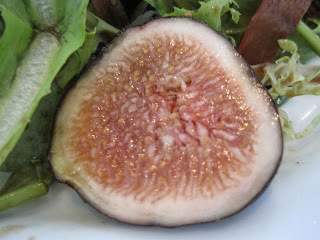 I'd hemmed and hawed over what to order, torn between a fig salad and wanting something more satisfying. Sara solved my dilemma by offering to split her braised short ribs sandwich if I shared my fig salad. Deal! We make a great team. 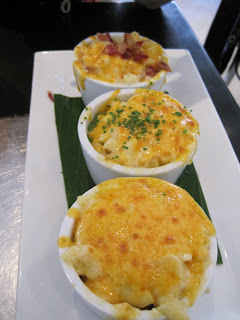 Before anything else, we had the "Mac Attack," a trio of different macaroni and cheeses. 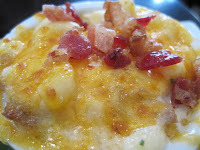 This tasting came with smoked gouda & bacon, truffle oil, and a fontina-cheddar blend. Truffle is a flavor that I feel not everyone likes, but it's really been growing on me. 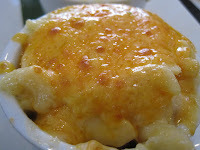 It's GREAT in this mac and cheese. Forget that expensive dish at Waverly Inn and just head here for a fraction of the cost! The braised short rib sandwich was ridiculously juicy, just salty enough, though we both agreed the bread was a bit bland. I felt it served to keep my fingers from getting too messy (though that still happened). 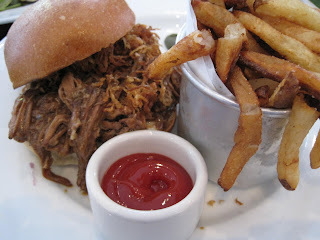 I would have loved a mustardy bite to this meat, but that could just be my pulled pork obsession talking. Regardless, it was still delicious as is. 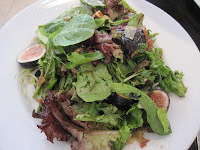 The fig salad sounded GREAT on the menu: fresh figs, shaved parmesan, crispy prosciutto, and a fig balsamic. I was glad to find it was delicious, too! The different textures all worked well together. The sweetness of the figs (with their soft-crunchy seeds that are half the fun) balanced so well off the salty cheese the prosciutto. 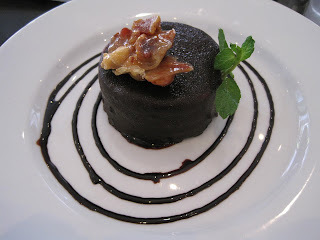 I really enjoyed the flavorful fig balsamic, too. This was a delicious dish to try, but I'm glad we had the short ribs, too. It was all just enough food to fill you up...without leaving you too stuffed for dessert! Sara was eyeing the apple ravioli, and I'd been deciding between the peanut butter cup and the homemade butter pecan ice cream. 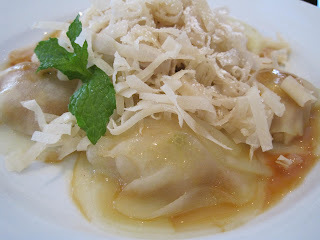 When I saw the ravioli CAME with butter pecan ice cream, that clinched it for me--another share-off! I ordered the PB, she got the ravioli. 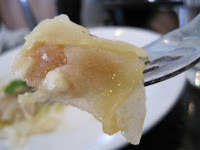 The ravioli was delicious, like apple pie filling in a light dough, but in the back of my mind I kept thinking something was off. Only now am I realizing : I didn't see any ice cream on the dish! Update: Sara is telling me it was there, it was just under those fried dough thingies. What a heartbreak. Sara says it's not that great, so I didn't miss much. 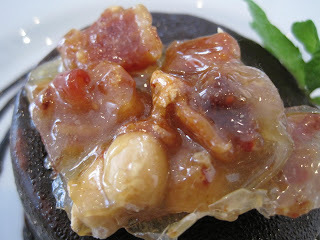 The peanut butter cup came with an intriguing topper: BACON peanut butter brittle. I'm not a brittle fan, but I do love bacon, and I do love peanut butter, and I was feeling adventurous. The peanut butter filling was super smooth and creamy, but the cookie crust is so hard we literally had to stab it and use serious force to cut it. They might want to consider serving it with a steak knife. The brittle, was, as we agreed, 'a little piece of awesome.' At first I was thinking "Hmm, I only taste peanut butter...still peanut butter...oh there's the bacon!" And sure enough, it works! This was a delicious meal, well worth the wait (I've only been here what, 8 years? Ha) I am glad I finally got to try it, and glad That Sara was there to join me!